Spent the weekend taking Andrew Weil around and teaching at The LEAF Festival. Finally got up to pee at 6:30 this morning and something was glowing at my feet. My phone? No, that’s on the dresser. My computer? No, that’s on the desk. A bomb? When I’m half-asleep in the pitch dark, anything’s possible. I reached down slowly, half-afraid to touch and set it off. First I hit something hard: my basket. Then cloth: my mushroom rap outfit. And under that, something cool and pliable. A mushroom! The jack-o-lantern! I took it out and it was glowing green as strong as a battery-charging light spread across a mushroom. It was ratty from the ride home, and yet, after a day and a half at the bottom of my basket, it was still glowing strong. I tried taking pictures with my phone camera: didn’t work, so here’s a photo and a video someone else has made instead — just in time for Halloween. I laid the “radioactive mushroom” on my pillow beside me, and the thought occurred to me: no one knows why these things glow. Maybe, like the crop circles, they have something to say! So I laid it on my third eye and waited. 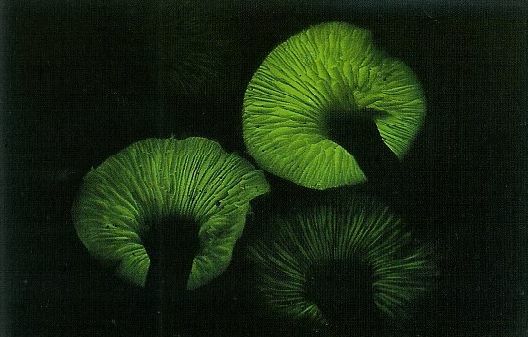 Now, I know this is a very toxic mushroom– not only do the gills glow green, but if you eat it, you’ll be “green in the gills” too (as one chef found out two months ago). But something doesn’t have to be edible to be valuable. 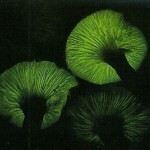 This mushroom, in fact, is not only good to dye with (that’s D-Y-E), but it’s being studied for cancer. And so, lying in the dark, as the mushroom fried my brain, I tried listening. Being a triple gemini, however, my mind wouldn’t shut up, and someone who’s constantly talking isn’t going to hear much. So next, I tried laying the evil mushroom on my heart. And I started to calm down, probably just from sitting still (or the mycocardiophathic effects). Otherwise, not much came obviously from that. My lower back was sore from dancing, so I turned over and placed it on that. And I got distracted writing notes. Five minutes later, sore back. Maybe I’m just impatient, but I encourage others more in tune to try this. Let me know what happens– unless you wake up with a sunburst pattern etched into your forehead.